Last week they announced the All Delighted People EP. And the week before the fall tour was announced. 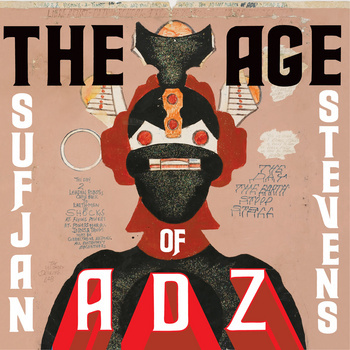 And today, Asthmatic Kitty announced the upcoming release of The Age of Adz (pronounced Odds), the first song-based full-length from Sufjan Stevens since 2005’s Illinois. 8/27 update: Preview of “I Walked” HERE. The Age of Adz will drop on October 12th (CD, MP3) with a double-LP following on November 9th. For the next three weeks you can pre-order the CD or LP, and receive an MP3 download on September 28th, two weeks before the release date. Wow… 2010 is the Year of the Sufjan. no free mp3 download or flac torrent here ever. if you like music, support it. buy it.